Head & the Hand Press, 9780989312523, 340pp. Literary nonfiction. Adrian was deployed two times to Afghanistan, first as an executive officer and then as a captain skirmishing with Taliban forces. Throughout his time overseas, he wrote letters to friends, fellow soldiers, and his family. Showing vulnerability to some and steadfastness to others, these letters form AFGHAN POST and chronicle his identity as it splinters under the strain of modern warfare. This epistolary memoir is a daring look into the mind and experiences of an Afghanistan war veteran. Its form allows readers to explore, along with Adrian, the social, emotional, and physical consequences of mental compartmentalization. 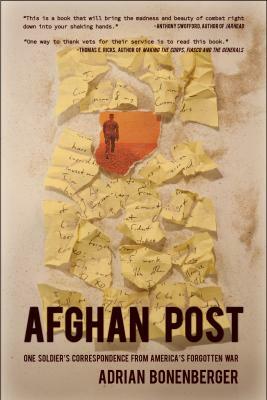 As one blurber put it, AFGHAN POST is "the story of a sensitive, intelligent young man as he comes to terms with conflict, privilege, duty, and ultimately himself.